Lille, France, the 22th of may, 2013: Micropross announced today the initialization of a collaboration with Greater China based test laboratory BCTC (Bank Card Test Center) aiming at adding the capacity of performing test of contactless payment readers and smartcards according to the specifications of the EMVCo organization. BCTC purchased several Micropross EMVCo L1 contactless analog test benches, for their premises in Beijing and Shenzhen. BCTC will be able to supply outstanding service to their customers, by offering EMVCo L1 analog test to their already wide coverage, which includes test for People’s Bank of China and China Unionpay. 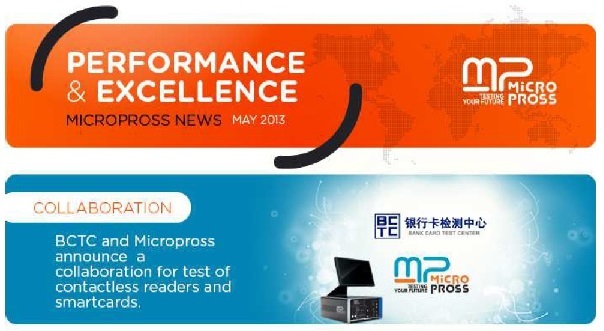 Philippe Bacle, President of Micropross, commented : “We are very happy to help BCTC reinforce its dominance in test of bank card for the Chinese market by supplying them our EMVCo L1 analog test solutions. Micropross has supported the Chinese smartcard test market for more than 10 years, and collaborating with the most important test laboratory in China defines a new chapter in this success story”. The EMVCo L1 test solutions represent just one part of the numerous testing options given by the Micropross Contactless Test Station. This revolutionary test tool combines all necessary hardware and software in one box, to perform compliance testing of contactless smartcards, readers, and NFC devices following the most relevant standards of the industry, such as the EMVCo, the NFC Forum, the ISO or the ETSI. Micropross Contactless Test Station became over the years the standard for any chip designer, device maker, and test laboratory looking for quality, durable, and automated test equipment. All major NFC chip developpers have selected this product to perform pre-certification in their research centers, and its presence inside certification laboratories is excellent. On the banking side, new laboratories that have been certified on EMVCo, Visa or Mastercard specifications based on the Contactless Test Station are announced on a very regular basis, and on the NFC Forum testing side, Micropross presence is already ultra-dominant. Technically superior to any alternative test solution, widespread within the industry, and dominant inside certification laboratories, the Contactless Test Station brings to your premises the widest coverage in terms of contactless testing, in style, thanks to its unique all-in-one concept.